Rudolf Bockelmann was the son of a schoolmaster. He studied music and philology in Leipzig. During the First World War he volunteered for the army and he was wounded several times. He debuted as an opera singer in Celle in 1920. From 1921 to 1926 he worked in Leipzig. From 1928 onwards he was very succesful at the Festspiele in Bayreuth as Wotan. From 1932 to 1944 he held an engagement at the State Opera in Berlin. He also performed in London and in the USA. After the war his reputation was damaged because he had been a member of the NSDAP since 1937 and now his international career was over. He worked in Hamburg until he became a professor in Dresden in 1954. He died there in 1958. His wife was the singer Marie Wiegand (1902-1986). 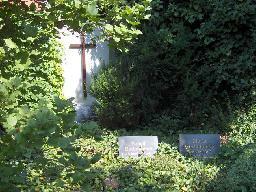 The grave of Rudolf Bockelmann at the Alter Katholischer Friedhof, Dresden.